Avaaz - Sanction Israel now! 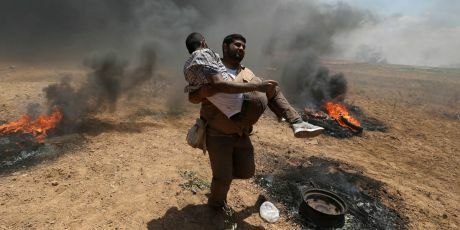 As citizens shocked by the indiscriminate killing of civilians in Gaza, we call on you to immediately impose sanctions on Israel until Palestinians are granted full and equal civil rights. This is a moment to show moral leadership -- we count on you to act. The stinking hypocrisy knows no bounds, and no shame. Israeli troops massacred 59 unarmed protesters yesterday, and shot 1300 more. 1300. They do it *gleefully* -- you can watch videos here and here. Yet Israeli spokesmen and their US allies constantly play the victim of “dangerous Palestinians”. CNN reports “deaths in clashes”. What clashes?? It was a massacre!! It IS a massacre. It’s going on today. Another instalment of 40 years of Israeli racist brutality and military repression. Avaaz battles racism everywhere. We’ve fought Arab dictatorships for years and it’s time to fight the Israeli one. Israel today is an ethnic dictatorship -- one of the most brutally racist regimes on the planet. It has become unhinged, and it deserves to be a pariah state. Other states have faced sanctions for far less. Sanctions on South Africa helped free its black people, it’s time for sanction on Israel to free the Palestinians. It’s time for the world to rally behind sanctions on Israel.